Laparoscopic nephrectomy is the gold standard for a localized renal cancer. Laparoscopic indications are still growing but some relative contraindications are becoming indicated with the acquisition and development of new skills and expertise in the laparoscopic field. 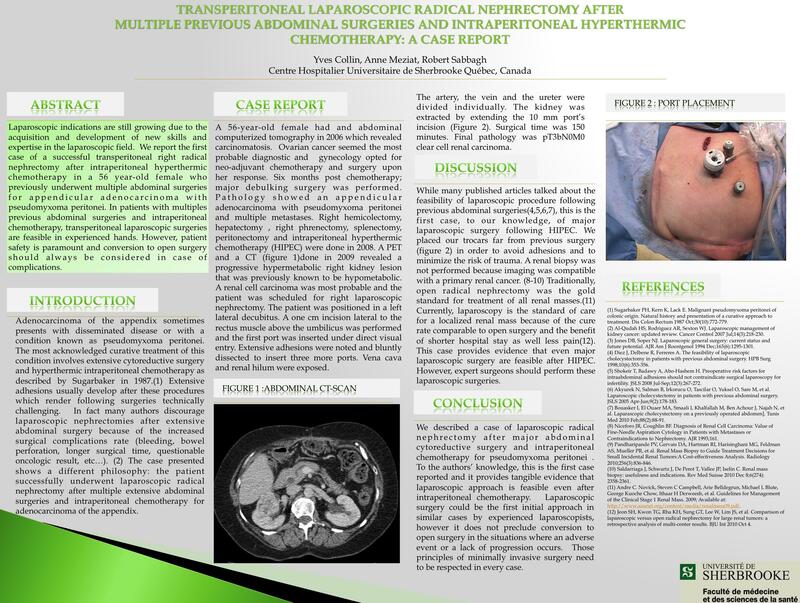 Some authors claim that previous abdominal surgery is a contraindication to laparoscopy but we report the case of an uneventful transperitoneal right radical nephrectomy for renal carcinoma in a 56-year-old white female with a hostile abdomen. Our patient was a 56 year-old female known for appendicular adenocarcinoma with pseudomyxoma peritonei.The treatment of this condition had required five abdominal surgeries and intraperitoneal hyperthermic chemotherapy on a 4-year period. During follow-up for her adenocarcinoma, a right renal carcinoma was found. She was scheduled for transperitoneal right radical nephrectomy. A one cm incision lateral to the rectus muscle at 5 cm above the umbilicus was performed and the first port, an XcelTM bladeless trocar (Ethicon Inc, Somerville, NJ, USA) was inserted under direct visual entry with a 10 mm 0-degree lens. Once the peritoneal cavity was entered, extensive adhesions were noted and a pneumoperitoneum was set at 15 mmHg. Adhesions were carefully dissected using the blunt 10 mm 0-degree lens in order to make enough space to insert the remaining four trocarts. The rest of the nephrectomy was performed according to the following steps: right colon mobilization, control of the right renal artery and vein and dissection of the ureter, lower and upper pole. The kidney was retrieved by extending the 10mm port’s incision. Surgical time was 150minutes and blood loss was 100cc. Post-operative period was unremarkable and she was discharged after four days. In patients with multiples previous abdominal surgeries, transperitoneal laparoscopic surgeries are feasible in experienced hands. However, patient safety is paramount and conversion to open surgery should always be considered in case of complications.